Religious Zionist party votes to support relatively liberal candidate for Ashkenazi Chief Rabbi. The Bayit Yehudi religious Zionist party voted Sunday to endorse Rabbi David Stav's candidacy for Chief Ashkenazi Rabbi. Bayit Yehudi Chairman, Minister Naftali Bennett, announced his support for Rabbi Stav, and described him as “a rabbi who will unite the Israeli nation and bring about meaningful changes in the connection between the Israeli public and Jewish tradition.” The faction then held a vote in which support for Stav's candidacy was officially approved. "We fulfilled our promise to the voters today, religious and secular alike,” Bennett said afterward. “The Bayit Yehudi will continue to be a bridge between religious and secular people in Israel, and today's decision reflects this in the clearest way,” he added. 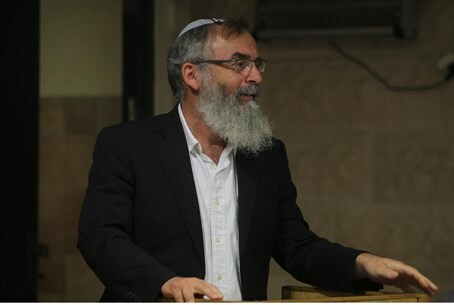 Bennett noted that Rabbi Stav is a member of the Tzohar Rabbis' group and said that he would create “an important change” in the Rabbinate, bringing religious and secular people closer. Tzohar is a relatively liberal minded group of Orthodox rabbis that has been offering itself to the general public for life cycle ceremonies, as an alternative to hareidi rabbis. The party was previously split over whether to support Rabbi David Stav or Rabbi Yaakov Ariel for the position of Chief Ashkenazi Rabbi. Now the party has come to a new decision, following the Knesset’s decision not to raise the maximum age for the Chief Rabbi, which would have allowed Rabbi Ariel to run. Sources told Arutz Sheva that Bayit Yehudi will support Rabbi David Stav for the position of Chief Ashkenazi Rabbi, and Rabbi Shmuel Eliyahu for the post of Chief Sephardi Rabbi.